The Hogs will wrap up the weekend today, but to make sure they got the full Razorback experience, Morris made sure nothing was cancelled due to hazardous road conditions. On the schedule was a recruiting social after dinner at his house on Saturday evening, so to make sure parents could make the drive he salted the roads so they could get there safely. 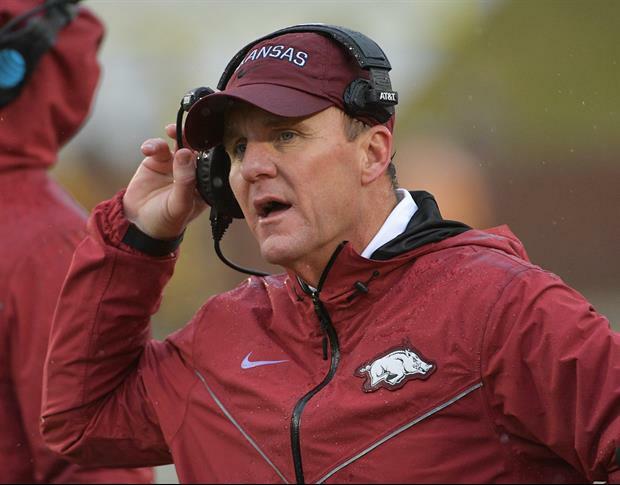 “People thinking @coachchadmorris recruiting stuff is lip service: instead of cancelling recruiting social after dinner at his house, he personally went to Home Depot earlier today & salted not only his driveway but his ENTIRE neighborhood & roads to it to get parents here,” Arkansas assistant director of football operations SJ Tuohy posted on Twitter just after midnight. It takes approximately 12-15 minutes to get to Morris’ house in east Fayetteville from downtown Fayetteville. Hard work should be allowed. I think he might be in the clear. Hmmmm....entire neighborhood.....how about all of the other roads to get to the neighborhood that they were risking their lives with?? You are one gay homosexual. "his entire neighborhood AND ROADS TO IT" Learn how to read..
Those 3 Stars will love that. Arkansas has 5 more 4 stars than Auburn. Awkward. Friggn Plainsmen, I remember the days when they said basketball was a nothing sport and anyone who took college hoops seriously were just a bunch of wimpish morons who couldn't win at football. Bama fans said the same thing. Now they are firing coaches at Tuscaloosa after 3 years in hoops and the Aubies are giving the DIRTIEST coach in the SEC an extension and raise. I predict within 3 years the NCAA will be all over the Cowpie Campus.